A big thank you goes to Daniel Haviv for his suggestion to use ORC with Snappy compression over Tez (with Vectorised reads) as well as the advice he provided to easily set this up. I have updated the post with the figures from this configuration. A while ago I wrote about using Google BigQuery to deliver BI projects faster and for a fraction of cost. Google wrote the original white paper that gave rise to the Hadoop ecosystem we use today for Big Data, but abandoned the technology soon afterwards. Given that Google has moved in a different direction to some of the other vendors I thought it would be interesting to see how Microsoft's HDInsight stacks up against Google's offering in the Big Data space. In this post I am going to do a rather detailed comparison between the two Big Data offerings. Looking at not just query performance but also data loading, cost, data location and the reporting tools supported by each platform. The dataset was extracted into CSV files using UTF-8 encoding. The total size on disk for the uncompressed CSV files is 63.5GB. While this is certainly not a large volume of data, it will be adequate for the overall comparison between the two tools. For example if the performance over this volume of data is not satisfactory for any of the two tools then adding a larger data volume will only exacerbate those performance woes or might show that more hardware is required which will in turn drive up the cost. The focus is to provide an overall comparison across many different areas of the two tools in question. One of the challenges of large data volumes and cloud platforms is simply "How do I get my data loaded efficiently?" In our situation 63GB of data is small in the realm of Big Data but still would pose a challenge if you had to upload that amount of data each day to your specific cloud platform. Luckily both BigQuery and HDInsight support the use of compressed files, albeit in a very different manner. For uploading the data to Azure Blog Storage there are multiple options. I uploaded both compressed data sets to two separate Blob Containers using Azure Storage Explorer. For production command line use AzCopy would be the preferred choice. After the upload was complete the data looked as follows in my storage account. Data can be streamed directly into tables. Data can be uploaded as either CSV or JSON files, both either as uncompressed files or GZip compressed files. 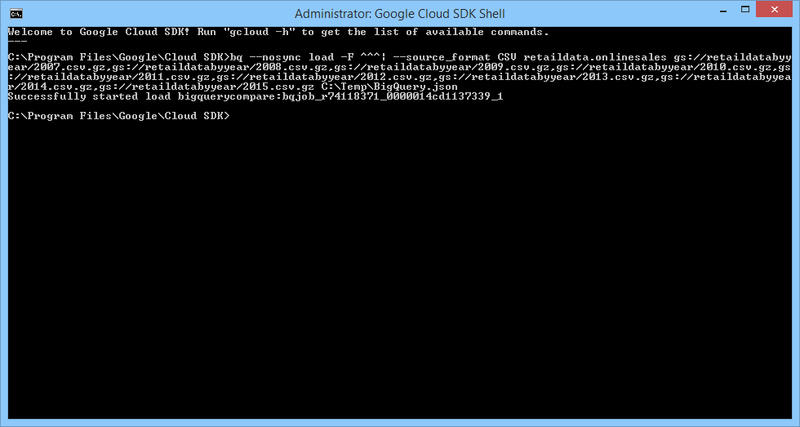 Data can be loaded from a Google Cloud Datastore backup. The recommended way to load files into BigQuery is to first load the files into a Google Storage Bucket and then to load the files from there into the designated BigQuery table using the bq command line tool. Loading uncompressed data is faster than compressed data, however what time you save in the loading process you lose in the uploading time as the files will be much larger. One additional nice feature is the ability to kick off the loading of multiple files in parallel into the same target table asynchronously. This can speed up the loading of your data tremendously. The following link provides more information about preparing data for BigQuery. In order to load the data for this test into BigQuery I used the web interface to simply upload my 9 yearly files into a Google Storage Bucket. For production environments the bq command line tool would be the preferred way. After the data was successfully uploaded into the Storage Bucket I used the bq command line tool to load the files into my BigQuery table. First I had to create a JSON file that represents the schema of my data, this file is used during the loading process to create the table that the data is inserted into. Alternatively I could have specify this schema as part of my call to the bq command but since we have a fair few columns the JSON file was easier to work with. Below is the bq command line syntax used to load all 9 files in parallel. (Notice the use of the triple caret symbol ^^^, this was used to escape the pipe symbol | in the windows command prompt.) For more information about using the bq command line tool you can look at the documentation here. BigQuery also now provides a Web UI for loading data from either files on your local infrastructure or files from a storage bucket into designated tables. This does make life much easier but has one drawback which is that you can only load one file at a time. When loading multiple files in parallel, like I am doing here, the bq command line tool is the best option. Below is the results of the loading process shown in the Job History of BigQuery. It took 16 minutes to extract the compressed files and load them into the table. Because the storage of the data is handled by BigQuery there is no need to split files into smaller chunks to try to gain better performance out of the system. In order to compare the performance of both platforms I created two queries. The first query is a very straight forward aggregation of the sales quantity grouped by year. The second query is a distinct count query that counts the number of distinct customers per product category per year. I chose the distinct count query specifically as it has traditionally been a performance challenging operation to perform in tools such as Analysis Services or in SQL Server itself. A TSQL example of each of these queries are shown below. Hive has become the de facto interface for Hadoop. It allows users to run map reduce jobs by using a query language called HiveQL which is very similar to SQL. Hive translates your HiveQL queries into MapReduce jobs and does incur an overhead for doing that. For this comparison we will be using Hive since most data professionals will be using Hive or one of the other tools that provide an abstraction on top of raw MapReduce as most reporting tools that work with Hadoop also uses this interface. I had to limit the number of data nodes to 13 for clusters 1 and 2, but had to reduce it to 5 for cluster 3 as I am only allowed to create a cluster with a maximum of 60 cores with my MSDN allowance. None the less these clusters should provide enough raw power to process through our 63GB of data. For those that don't know, the D machines are much more powerful machines than the normal A machines (60% faster CPU) and also have local SSD storage which the A machines do not have. The A8, 9, 10 and 11 machines are for compute intensive work so I decided to include a cluster using these machines as well. For more details about the machines have a look here. Spinning up a cluster is not instantaneous. The spin-up time for each cluster is shown in the table below. All our queries were run using Hive on Apache Tez to take advantage of the performance benefits Tez provides. Each query was run once without intermediate and output compression and once with intermediate and output compression. The codec used for intermediate compression was Snappy and for output compression Gzip, this choice was based on the guidelines in the book Programming Hive as well as the Microsoft white paper Compression In Hadoop. There are many more codecs that can be used and exploring all of them falls outside of the focus of this blog post. As we were using Azure Blob Storage for our storage layer I created two external tables, one on each of the folders I loaded the datasets into. Other than changing the table name, the syntax of the queries did not need to be rewritten to run on Hive and could be run exactly as they were in TSQL. Granted these are very basic queries but it is still welcome to see as it makes HiveQL easier to pick up for new users. Below are two examples of the syntax used to run the queries. The results of the queries on each cluster are shown below. In almost all cases, except for the DISTINCT COUNT on Cluster 3, the queries running with compression enabled were faster, and sometimes by significant margins. From the results it is also clear that the choice of machines, the size of your cluster and the way you split your source files have a significant impact on your performance. It is clear that there are a lot of factors to consider when creating HDInsight clusters and that creating an HDInsight cluster is a complex undertaking if you want to get the best performance for you money. Based on the comment from Daniel Haviv I have included a set of tests where I converted the data to ORC format and then ran the queries over Tez with Vectorised Reads. Below are the results on each of the clusters. It is worth noting that the process of converting the data from its compressed format in Azure Blob Storage to ORC format in HDInsight does take additional time. Each of the results below also shows how long it took to load the data into the ORC format before the queries could be run. It is clear from the above results that the ORC format is much faster for the SUM aggregation however it seems that it did not improve the DISTINCT COUNT query times in any significant way. 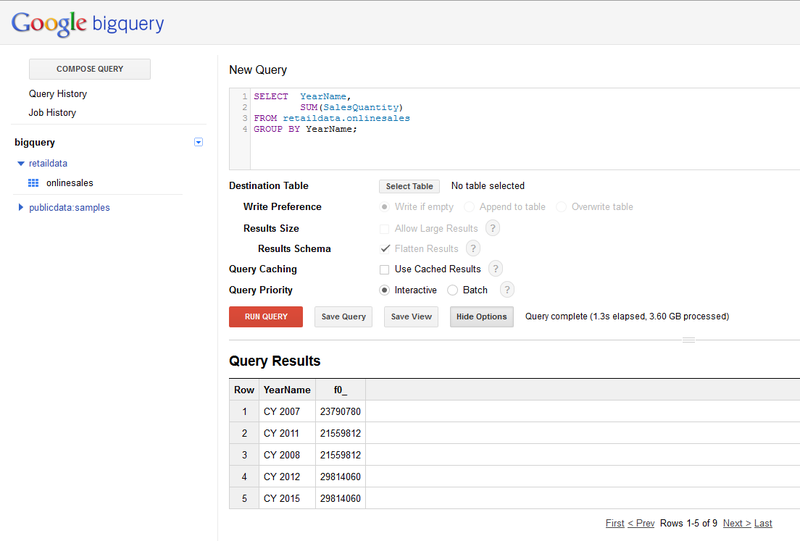 Once the data has been loaded into a table in BigQuery it is ready for querying whenever you need. BigQuery does not have the concept of machines or a cluster like HDInsight. There is no hardware configuration or administration that needs to be done. BigQuery is a massively parallel processing column store technology built from Google's Dremel technology. That means that your queries would only run against those columns in a table which are defined in your queries. BigQuery uses its own SQL-like syntax which is constantly being brought closer to ANSI SQL. In some circumstance you might need to change your query to take advantage of BigQuery SQL functionality. 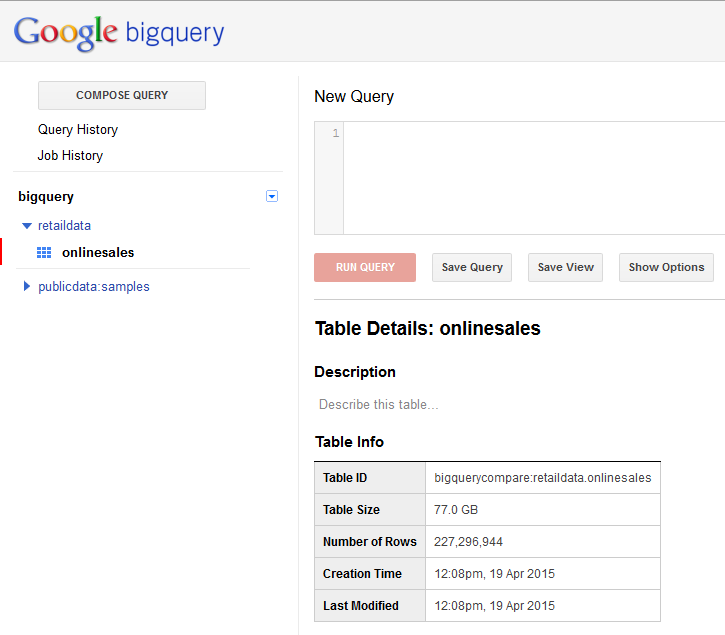 A quick look at the details of our table in BigQuery shows us the following. Our compressed files were extracted and takes up 77GB of space in BigQuery. The first query is our SUM query. This query requires no modification, other than changing the table name against which it is running. There is no compression settings or engine settings to configure. The only settings are shown in the screenshot below. The most interesting here is the Query Caching and Query Priority. Query Caching will fetch the results of a query from the query cache if the results exist in the cache. This normally translates into an extremely fast response if the results have previously been cached and also has the added benefit that Google does not charge you for results fetched from the cache. For more information see the documentation here. Query Priority determines how fast your query will be submitted and executes. If set to Interactive the query is run immediately and is billed at a higher rate. If set to Batch the query is executed when idle resources becomes available which is normally within a few minutes but could take up to a maximum of 3 hours. Batch queries do not count to your concurrent rate limit in BigQuery, making it easier to start many queries at once. For more information see the documentation here. The SUM query completed and returned the results in 1.3 seconds and processed 3.6GB of data. The DISTINCT COUNT query also required no syntactic changes. The query completed and returned the results in 2.2 seconds and processed 6.89GB of data. Below is a table that shows the execution times of each query with Batch and Interactive priority as well as with Caching turned on. One of the most contentious issues with regards to using cloud service is the issue of data location. Due to the regulations that govern some organisations this can prevent the use of services that cannot guarantee that data would not leave a specific geographic region. This was an area where up to recently HDInsight was ahead of BigQuery, specifically within Europe, as Microsoft Azure provided many more regional options for deploying your clusters. However Google has recently announced the availability of European data availability control, so at least in Europe we now have a choice. You have the option to configure where your cluster is created from the Azure portal, making it a simple and straight forward process. In order to specify where your data is located you need to get in touch with the Google Cloud Platform technical support team. This does introduce a manual step and it would be welcome if in future this could be provided as a configuration choice similar to how HDInsight provides it. Once you have your results you need to display this information to your users. Both of the two platforms support many different reporting tools however native support is not always available in all reporting solutions. As can be expected HDInsight benefits from native support in the Microsoft reporting tools. Power Query has built-in capabilities to pull data from both HDInsight as well as Azure Blob Storage which allows you to expose datasets from HDInsight easily to end users and tools such as Power View. 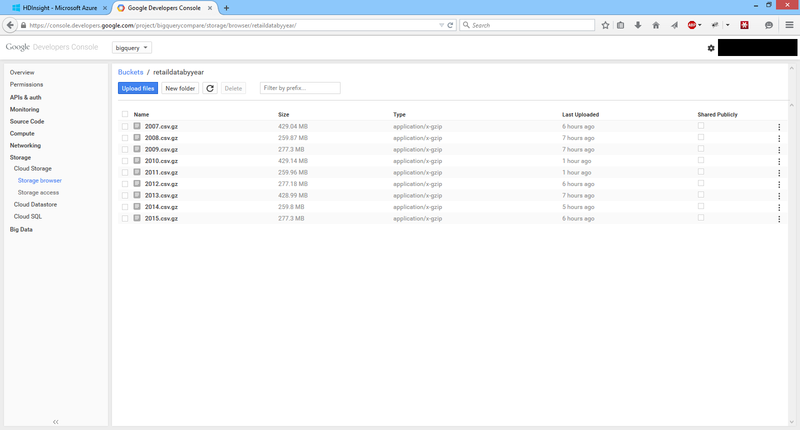 A Hive ODBC Data Source is also available which allows you to run data against Hive from any tool that can create an ODBC connection. HDInsight is also supported by many of the other popular reporting tool through the ODBC driver that Microsoft makes available with HDInsight. The pricing model between the two products differ greatly, which makes a head to head comparison extremely difficult. HDInsight charges for the up-time of the machines used in your cluster while BigQuery charges based on how much data you have stored as well as the amount of data your queries process. BigQuery does not charge for the availability of the service. In order to do a comparison I performed two types of calculation. Our first calculation will be a look at how much it would cost to keep each service running for an entire month 24 hours per day. The second calculation will be a per query calculation to show how much it would cost to run each of our queries. For calculating the cost of running our clusters I used the Azure Pricing site. For the purposes of our calculation we will calculate our storage for only one dataset of 2.83GB and not for both of the datasets I loaded for testing. We will also calculate 1 month as 744 hours (24 hours * 31 days). As mentioned earlier BigQuery charges based on the amount of data stored in all of the tables in your BigQuery project plus the total data processed in each column your queries select. As we saw earlier our queries only processed a small subset of the total amount of data stored in our table, this is due to BigQuery using a columnar data structure. BigQuery charges $5 per TB of data queried per month, with the first 1TB being free, and $0.020 per GB stored per month. In our scenario we did not stream data directly into BigQuery in a real-time fashion, this is charged at a different rate as well. For an entire breakdown of the pricing of BigQuery please have a look at the BigQuery Pricing site. In order to perform our calculation for a monthly cost I will create three scenarios ranging in storage size as well as query size. In order to calculate the amount in British Pounds (£) I am using the current exchange rate of $1 = £0.66. As mentioned earlier the first 1TB of queries per month is free and thus this is reflected in the price of each scenario. In order to calculate our per query cost I simply divided the price that Google provides for their 1TB of queries to get a per GB price which I then multiplied with the amount of data our queries processed. This gives us $0.005 per GB. As mentioned earlier the first 1TB of queries per month is free and thus the price per query shown here would only be applicable after that free quota was consumed. Each section in this post has given detail of how both HDInsight and BigQuery work and stack up against each other. My overall feeling after spending a lot of time with both solutions is that they differ vastly. Below are some final thoughts about each product. HDInsight would probably work better for completely unstructured data sets, however in the scenario we have tested here it did not impress me at all. Firstly HDInsight requires a lot of planning and administration to ensure that your files are in the correct format and size to allow for optimal query performance. On top of this planning you still have to deal with all the administration of starting up cluster and bringing them down once you have finished running your jobs. The performance of HDInsight and Hive was unimpressive at best when not using ORC and Snappy compression. Storing data in ORC format with Snappy compression did provide some much needed reductions in the SUM aggregation query times, however the DISTINCT COUNT was not reduced by much if at all. HDInsight and Hive is not suitable for real-time querying of your data directly from reporting tools. It would need to be combined with some other technology like SQL Server Analysis Service, which incidentally is one of the solutions proposed by Microsoft. The cost of HDInsight is yet another pain point for me. HDInsight quickly becomes very expensive when you start using large clusters with powerful machines. The fact that you can use them on an on-demand basis does alleviate some of the issues with cost but increases your administration burden, and could lead to very expensive mistakes if a cluster is not brought down and left to run for longer than required. On a positive note HDInsight integrates extremely well with the Microsoft ecosystem of tools. The support for it in all of the Microsoft reporting tools allows for some very interesting use cases and does make it easy to integrate into any analytics projects on the Microsoft platform. HDInsight and Azure Blob Storage work extremely well together and allows you to build a data lake with ease. Another area in which HDInsight, and the Azure platform as a whole, performs extremely well is with regards to its fine grained control of data regions. HDInsight provides many regions to choose from and administering this is a straight forward and easy matter thanks to a great user interface or alternatively the easy to use API allowing it to be done programmatically. The documentation for HDInsight and the rest of the Azure platform is very good. This is something that is taken for granted by those who have been working with Microsoft technologies. Being able to get detailed continuously update documentation on almost everything about a product or platform should never be overlook and for this HDInsight and Azure gets top marks. BigQuery is billed by Google as a true cloud service for Big Data due to it requiring no administration of machines of any kind. In this regards BigQuery is definitely the easier product to use. It requires absolutely no administration of machines and is always ready allowing you to query your data on demand. The performance of BigQuery was orders of magnitude faster than HDInsight. 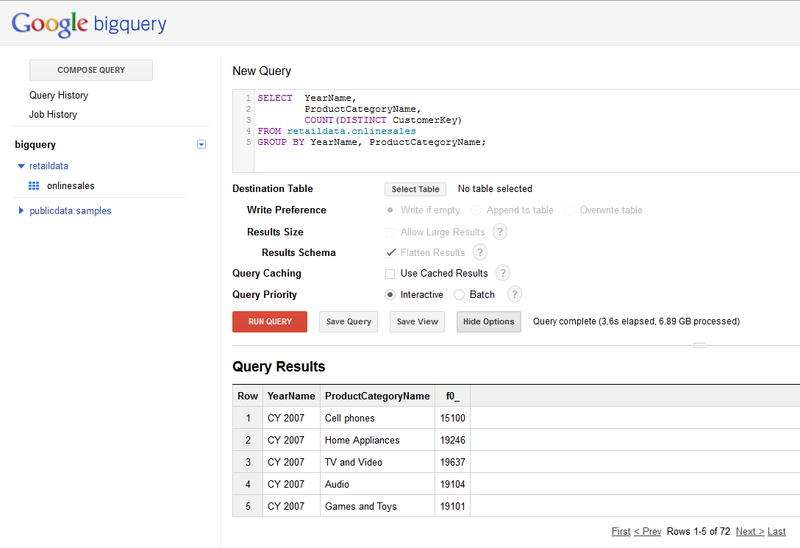 BigQuery is a real-time querying tool for large volumes of data that delivers on its promises. In our tests we used a small dataset of only 63GB but BigQuery was designed, and is used, to query Petabytes of data and is the tool used internally at Google to crunch through the mountains of data created by their data centres. 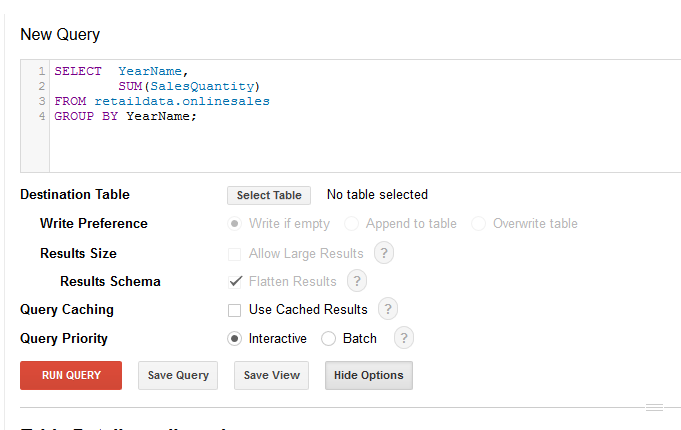 Another area where BigQuery shines is with regards to cost. It is an extremely cost-effective solution and remains cost-effective as your data volumes grow. Not only is it vastly cheaper to run than HDInsight but the billing is also much simpler. Where BigQuery starts to suffer is when you try to integrate it with the Microsoft reporting tools. By using the 3rd party ODBC drivers for BigQuery you can integrate it with the Microsoft Reporting tools but none of the tools support BigQuery natively. If you however use any of the other non-Microsoft reporting suites such as Tableau, Qlikview or Targit then you have no problems at all as they have built in support for BigQuery and integrate perfectly with it. Another area where BigQuery lags behind HDInsight is with regards to the data regions in which your data can be located. Not only is the choice of data regions more limited but in order to set the location of your data you need to contact the Google Cloud Platform technical support team. Hopefully this process will be improved in future to remove the manual step and also to increase the number of regions to choose from. BigQuery is let down somewhat by its documentation. The documentation is not as good as the HDInsight documentation and sometimes contains code snippets that are old. This lack of constantly curated and updated documentation does BigQuery a great injustice as it detracts from an otherwise fantastic tool and can cause some frustration for its users.